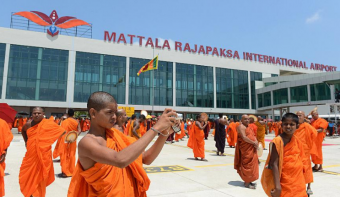 The Sri Lankan government announced at the end of June that it is looking for Expressions of Interest (EOI) from investors looking to undertake commercial operations at Mattala Rajapaksa International Airport (MRIA), the country’s number two international airport. With just two daily flights — the second just being added in May — this international airport can be argued to be the world’s most underused, and has been a consistent financial drain on Sri Lanka’s Transport and Civil Aviation Ministry since it opened in March of 2013. To put it simply, the airport is not generating enough revenue to pay back the $190 million of loans that were provided by the Exim Bank of China to build it. Although submissions of of EOIs are open until August 12, a potential buyer for the airport has already surfaced. According to Sri Lanka’s Sunday Times newspaper, “arrangement are being worked out” for IZP, a Chinese informational technology company, to pick up the struggling airport to add to its growing portfolio of Silk Road investments. For many years there was a very strong demand for Sri Lanka to add additional international aviation capacity. Air traffic through Colombo was getting too heavy, and the country either had to add an additional runway there or build or expand another airport elsewhere. At a cost of $209 million — most of which coming from China — Sri Lanka chose the later option, building Mattala International far out in southern Hambantota district, a 250 kilometer drive from Colombo. This airport started out as a key part of an ambitious plan by Sri Lanka’s former president Mahinda Rajapaksa to transform his extremely rural hometown region into Sri Lanka’s number two metropolis. In addition to the airport, there would be a $1.4 billion deep sea port, a large industrial and export processing zone, an exhibition center, a large cricket stadium, and a hotel and leisure area that would be connected together by some of the country’s best highways. The idea was that all of these large projects would rise up together and support each other. It was an all or nothing wager placed on creating an entirely new economy.